Join us and numerous other Wedding Professionals at the Westridge Golf Club’s Bridal Show. 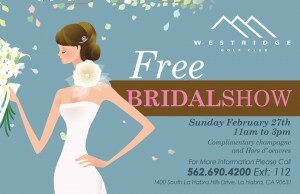 The Westridge Gold Course was rated best of The Knot.com for 2008/2009. It’s a great venue and a must see as a possible venue for your Wedding. The show runs from 11am to 3pm. “so.. one day I was craving sweets. & i decided to yelp. & found this. my oh my. when i first came here, i had their red velvet cupcakes & they were so nom nom. “I recently ordered a cake from Pattys and was impressed with the excellent customer service. Starting with the initial phone call, all of my questions and concerns were answered in a helpful way. I ordered a birthday cake for my friends with a photograph on top. Choosing the flavor/filling was so hard, but I decided on red velvet with a cream cheese filling. When I went to pick up the cake, Phillip gave me a preview of the enlarged photograph before putting it on the cake. When the cake was finished, I was amazed at the quality of the photograph and the fact that it was edible! I kept sneaking peaks at the cake before the birthday gathering, it was so beautiful! It was a huge success at the party, my friends loved it! The red velvet flavor was good, but I couldn’t taste the cocoa that is supposed to be in red velvet. The frosting was delicious though! Our friends at Doug Reynolds Video Productions just announced that they are going to offer a Free “Save the Date” Video With your purchase of any Wedding Cake at Patty’s Cakes and Desserts. Valentine’s Day Cupcakes, Brownie Hearts, Cake Balls and more! We’ll be open from 10am-6pm today with plenty of deliciousness ready for pickup. We’ll have Cupcakes, Cake Balls, Brownie Hearts, Chocolate and Dipped Strawberries. See you soon! [Review] Cake Balls: The Taste Is Out Of This World! “Red velvet cake balls, anyone??? We used to live a block away from this place but moved 15 minutes away about 7 years ago. We were finally introduced to it through http://www.groupon.com/deals/pattys-cakes-desserts and have been addicted ever since!